Making a rainbow salad is is fun and easy at the same time. 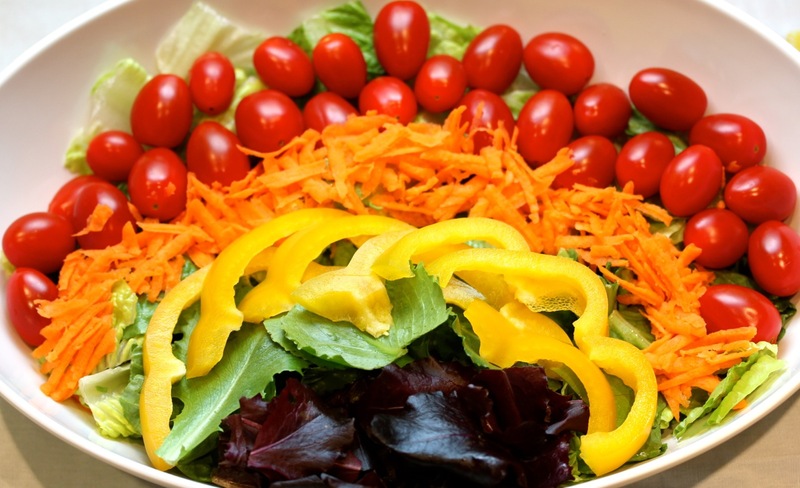 Your kids would also love to help you make this salad given how colorful it is. The salad takes little preparation and you can keep it in the refrigerator for almost a week. Vegetables, fruits and beans of different colours would not only make your salad less boring, but will also add a variety of vitamins, minerals and nutrients to your diet without adding extra calories. Cook three ounces green beans in boiling water for three minutes until they are soft. After 3 minutes drain the beans, rinse in cold water and set aside. Peel the orange with a knife or a peeler. Cut it in half and slice the flesh. Also cut tomatoes, onion, beetroot and cucumber in chunks of your preferred shapes and sizes. Spread the salad leaves into a large salad bowl. Scatter over the slightly cooked beans, sliced orange, tomatoes, cucumber, onion, beetroot, cranberries and pumpkin seeds. Put all the dressing ingredients in a medium sized mixing bowl and whisk them well. Finally you can add seasonings to taste and serve. Combine all these ingredients in a large salad bowl. Add oil of your choice, in desired amount, for dressing. Toss and chill before serving.